JER 316And it shall come to pass, when ye be multiplied and increased in the land, in those days, saith the LORD, they shall say no more, The ark of the covenant of the LORD: neither shall it come to mind: neither shall they remember it; neither shall they visit it; neither shall that be done any more. 2Speak unto the children of Israel, that they bring me an offering: of every man that giveth it willingly with his heart ye shall take my offering. offering Heb. ךְתְּרוּמָה, separation. They shall set apart from their property an offering for Me. whose heart inspires him to generosity Heb. יִדְּבֶנּוּ לִבּוֹ, an expression of נְדָבָה, which is an expression of good will, present in French, [a] gift. you shall take My offering Our Rabbis said: [The word ךְתְּרוּמָה, mentioned three times, denotes that] three offerings are mentioned here. One is the offering of a beka [half-shekel] per head, from which they made the sockets, as is delineated in [Exod. 38:26, 27, in the parsha] “ אֵלֶּה פְקוּדֵי, These are the accounts.” Another is the offering of a beka per head for the [community] coffers, from which to purchase the communal sacrifices, and another is the offering for the Mishkan, each one’s [Israelite’s] donation (Talmud Yerushalmi, Shekalim 1:1; Meg. 29b). The thirteen materials mentioned in this section [i.e., this chapter] were all required for the work of the Mishkan or for the garments of the kohanim, [as you will find] when you study them closely (Tan. 5, Song Rabbah 4:25). 1. "And Hashem spoke to Moses, saying, 'Speak to the children of Yisrael that they bring Me an offering, of every man whose heart prompts him...'" (Shemot 25:1-2). Rabbi Chiya opened the discussion saying: "For Yah has chosen Jacob to Himself, Yisrael for His peculiar possession" (Tehilim 135:4). How beloved are Yisrael before the Holy One, blessed be He, who desires them, and wants to be attached to them and connect Himself with them to make them a single nation in the world, as it is written: "And what one nation in the earth is like Your people Yisrael?" (II Shmuel 7:23). They wanted Him and were attached to Him, as it says, "For Yah has chosen Jacob to Himself" and, "For Hashem's portion is His people" (Devarim 32:9). He gave ministers and officers to the other nations and took Yisrael to His part. gold, silver, and copper, etc. They were all given voluntarily; each person [gave] what his heart inspired him to give, except [for] the silver, which they gave equally, a half-shekel for each individual. We do not find throughout the entire work of the Mishkan that more silver was required, as it is said: “The silver of the community census was…a beka per head…” (Exod. 38:25, 26). The rest of the silver, which was given there [in the work of the Mishkan] voluntarily, they [the workers] made into service utensils. purple…wool Heb. וְאַרְגָּמָן, wool dyed with a kind of dye named אַרְגָּמָן. and goat hair Heb. וְעִזִים, the hair of goats. Therefore, Onkelos rendered: וּמְעַזֵי, [i.e.,] what comes from the goats, but not the goats themselves [i.e., not the goat skins], for Targum’s [Onkelos] translation of עִזִים [goats] is עִזַיָא (Gen. 30:32). dyed red Heb. מְאֳָדָּמִים. They were dyed red after being tanned. oil for lighting Pure olive oil to continually kindle the light. spices for the anointing oil which was made to anoint the vessels of the Mishkan and [for] the Mishkan itself to sanctify them, and spices were required for it, as is delineated in [the parsha] כִּי תִשָׂא (Exod. 30:22-33). and for the incense Heb. וְלִקְטֹרֶתהַסַּמִּים, which they burned every evening and morning, as is explained in [the parsha] וְאַךְתָּה ךְתְּצַוֶּה (Exod. 30:7, 8). The word קְטֹרֶת means the raising of smoke (קִיטוֹר) and columns of smoke ךְתִּמְרוֹתעָשָׁן. 7Onyx stones, and stones to be set in the ephod, and in the breastplate. shoham stones Two were needed there [in the Mishkan] for the ephod, mentioned in [the parsha] וְאַךְתָּה ךְתְּצַוֶּה (Exod. 28:9-12). filling Since they make for them a seat out of gold, like a sort of hole, and the stone is placed there to fill the hole, they are called filling stones. The place of the “seat” is called מִשְׁבֶּצֶת, a setting. for the ephod and for the choshen The shoham stones for the ephod and the filling stones for the choshen. The ephod and the choshen are explained in וְאַךְתָּה ךְתְּצַוֶּה they are types of ornaments [worn by the kohanim]. 8And let them make me a sanctuary; that I may dwell among them. And they shall make Me a sanctuary And they shall make in My name a house of sanctity. 9According to all that I shew thee, after the pattern of the tabernacle, and the pattern of all the instruments thereof, even so shall ye make it. according to all that I show you here, the pattern of the Mishkan. This verse is connected to the verse above it: “And they shall make Me a sanctuary…” according to all that I show you. and so shall you do in future generations (Sanh. 16b, Shev. 14b, 15a). If one of the vessels is lost, or when you make the vessels of the Temple, such as [the] tables, menorahs, wash basins, and bases that Solomon made, you shall make them according to the pattern of these [that I will describe in the following verses]. If the verse was not connected to what was written before it, He would not have written, “and so shall you do,” but" so shall you do" [without the word “and”], and it would be speaking about the making of the Tent of Meeting and its vessels. 10And they shall make an ark of shittim wood: two cubits and a half shall be the length thereof, and a cubit and a half the breadth thereof, and a cubit and a half the height thereof. 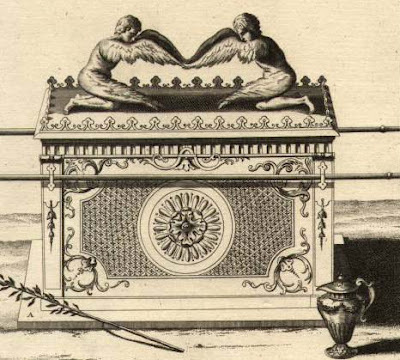 They shall make an ark like the chests that are made without feet, made like a sort of chest called escrin [in Old French, ecrin in modern French], (i.e., a chest or box), which rests on its bottom [without being raised off the floor by the attachment of legs]. 11And thou shalt overlay it with pure gold, within and without shalt thou overlay it, and shalt make upon it a crown of gold round about. a golden crown Like a sort of crown surrounding it above its rim. For he [Bezalel] made the outer ark higher than the inner one, until it extended upwards opposite the thickness of the ark cover and slightly higher than it, so that when the ark cover lies on the thickness of the walls, the crown extends slightly over the thickness of the ark cover (Yoma 72b). And that [the crown] is the symbol of the crown of the Torah (Tan. Vayakhel 8, Exod. Rabbah 34:2). 12And thou shalt cast four rings of gold for it, and put them in the four corners thereof; and two rings shall be in the one side of it, and two rings in the other side of it. And you shall cast Heb. וְיָצַקְךְתָּ, an expression of casting, as the Targum [Onkelos] renders. its…corners Heb. פַּעִמֹתָיו. As the Targum [Onkelos] renders: זִיוְיָתֵיהּ, its corners. They were attached on the upper corners, close to the ark cover, two from here and two from there, across the width of the ark, and the poles were placed in them [the rings]. The length of the ark separated the poles, two and one-half cubits between [one] pole and [the other] pole, so that the two people carrying the ark would walk between them [the poles]. So it is explained in Men., in the chapter entitled שְׁךְתֵּי הַלֶּחֶם (98b). two rings on its one side Heb. וּשְׁךְתֵּי טַבָּעֹת, lit., and two rings. These are the four rings [mentioned] in the beginning of the verse, and [Scripture now] explains to you where they were [to be placed]. This “vav” is superfluous, and it is to be interpreted as שְׁךְתֵּי טַבָּעֹת, two rings. But you can reconcile it [by interpreting it] in this way: and two of these rings [shall be] on its one side, [meaning, and two of the four rings mentioned in the beginning of this verse shall be on one side, etc.]. its…side Heb. צַלְעוֹ, its side. 13And thou shalt make staves of shittim wood, and overlay them with gold. 14And thou shalt put the staves into the rings by the sides of the ark, that the ark may be borne with them. 15The staves shall be in the rings of the ark: they shall not be taken from it. they shall not be removed from it forever. 16And thou shalt put into the ark the testimony which I shall give thee. And you shall place into the ark Heb. אֶל-הָאָרֹן, lit., to the ark, [meaning] into the ark. 17And thou shalt make a mercy seat of pure gold: two cubits and a half shall be the length thereof, and a cubit and a half the breadth thereof. an ark cover Heb. כַפֹּרֶת a cover over the ark, which was open from above. He [Moses] placed it [the cover] over it [the ark] like a board. 18And thou shalt make two cherubims of gold, of beaten work shalt thou make them, in the two ends of the mercy seat. you shall make…of hammered work [This means] that you should not make them separate and then join them at the ends of the ark cover after they are made, as smiths do [in a process] called solderez [in Old French], soldered. Instead, you should take a large quantity of gold at the beginning of the construction of the ark cover and beat it with a hammer and with a mallet in the center [of the mass of gold] so that its ends protrude upward, and [then you should] form the cherubim from the protrusion of its ends. hammered Heb. מִקְשָׁה, batediz in Old French, hammered, like “knocked (נָקְשָׁן) one against the other” (Dan. 5:6). ends of the ark cover Heb. הכַּפֹּרֶתקְצוֹת, ends of the ark cover. 19And make one cherub on the one end, and the other cherub on the other end: even of the mercy seat shall ye make the cherubims on the two ends thereof. from the ark cover itself you shall make the cherubim. This is the meaning of “you shall make them of hammered work” -that you shall not make them [the cherubim] separately and [then] attach them to the ark cover. NOTE: MERCY SEAT IS NOT USED IN RASHI'S TRANSLATION NOR IS IT MENTIONED - it was a "covering"
20And the cherubims shall stretch forth their wings on high, covering the mercy seat with their wings, and their faces shall look one to another; toward the mercy seat shall the faces of the cherubims be. their wings spread [This means] that you shall not make their wings lying down [resting next to their bodies], but spread high alongside their heads, so that there should be ten handbreadths in the space between the wings and the ark cover, as is stated in Succah (5b). 21And thou shalt put the mercy seat above upon the ark; and in the ark thou shalt put the testimony that I shall give thee. and into the ark you shall place the testimony I do not know why it was repeated, for it already said: “And you shall place into the ark the testimony” (verse 16). We may say that it comes to teach that when it [the ark] is still an ark alone, without an ark cover, he [Moses] should first put in the testimony and then place the ark cover over it. So we find [that] when he [Moses] erected the Mishkan, it says: “And he placed the testimony into the ark,” and afterwards, “and he placed the ark cover on the ark from above” (Exod. 40:20). 22And there I will meet with thee, and I will commune with thee from above the mercy seat, from between the two cherubims which are upon the ark of the testimony, of all things which I will give thee in commandment unto the children of Israel. I will arrange My meetings with you there When I arrange a meeting for you to speak with you, [it is at] that place that I will arrange for the meeting where I will come to speak to you. and all that I will command you unto the children of Israel Heb. וְאֵת. This “vav” [that Rashi adds, meaning “and,”] is superfluous, and there are many similar [examples] in the Torah. And you shall interpret it thus: "and all that I will speak with you there is all that I will command you unto the children of Israel." 23Thou shalt also make a table of shittim wood: two cubits shall be the length thereof, and a cubit the breadth thereof, and a cubit and a half the height thereof. its height The height of its legs [together] with the thickness of the table [top]. 24And thou shalt overlay it with pure gold, and make thereto a crown of gold round about. 25And thou shalt make unto it a border of an hand breadth round about, and thou shalt make a golden crown to the border thereof round about. and you shall make a golden crown for its frame That is the crown mentioned above, and here He explains to you that it was on the frame. 26And thou shalt make for it four rings of gold, and put the rings in the four corners that are on the four feet thereof. The rings shall be opposite the frame on the legs, inserted opposite the ends of the frame. as holders for the poles Those rings shall be holders in which to insert the poles. as holders Heb. לְבָךְתִּים, for the purpose of holders. for the poles Heb. לְבַדִּים, as the Targum [Onkelos] renders: אַתְרָא לַאִרִיחַיָא, a place for the poles. 28And thou shalt make the staves of shittim wood, and overlay them with gold, that the table may be borne with them. shall be carried with them Heb. וְנִשָׂא-בָם, the passive voice. The table shall be carried with them [by the poles]. 29And thou shalt make the dishes thereof, and spoons thereof, and covers thereof, and bowls thereof, to cover withal: of pure gold shalt thou make them. And you shall make its forms, its spoons Heb. קְּעָרֹתָיו וְכַפֹּתָיו. קְּעָרֹתָיו is the form that was made according to the shape of the bread (Men. 97a). The bread was made in the shape of a type of box without a cover. It had a flat bottom (Men. 94b) and it would be bent upward on both sides [forming something] similar to walls. Therefore, it is called לֶחֶם הַפָּנִים, literally, the bread of faces, because it has faces looking in both directions-toward the sides of the house [Mishkan] from here [in one direction] and from there [in the other direction]. It was placed lengthwise across the width of the table, and its walls stood vertically opposite the edge of the table. A golden form and an iron form were made for it. It was baked [on Fridays] in the iron form, and when it was taken out of the oven, it would be placed in the golden form until the next day, which was the Sabbath, when it would be arranged on the table. That form is called קְעָרָה. and its supports Heb. וּמְנַקּיֹתָיו. Its Aramaic translation is וּמְכִילָתֵיהּ, [meaning] and its bearers. They are branches like golden pegs [Mizrachi explains that they were like columns] standing on the ground and reaching a considerable height upwards above the table, corresponding to the height of the stack of bread. [They were] notched with six (Mizrachi-five) notches, one above the other, and the ends of the pipes between one bread and another were supported by these branches so that the burden of the upper breads should not weigh down on the lower ones and cause them to break. The derivation of מְכִילָתֵיהּ is “its bearers,” similar to “I am weary of bearing [it] (הָכִיל)” (Jer. 6:11). But I do not know how the מְנַקִּיוֹת applies to branches. Other Sages of Israel say that קְשׂתָיו refers to the branches, which harden (מְקֻשוֹת) it [the showbread] and strengthen it so that it does not break, and מְנַקִּיוֹתָיו refers to the pipes, which clean (מְנַקִּין) [the bread] so that it should not become moldy (Men. 96a). But Onkelos, who rendered [מְנַקִּיוֹתָיו as] מְכִילָתֵיהּ, understood it in a similar way to the words of the one [Sage] who says [that] מְנַקִּיוֹת are branches. with which it will be covered Heb. יֻסַּ, [meaning] with which it will be covered. Regarding the half-pipes, [Scripture] says “with which it will be covered” because they [the half-pipes] were like a sort of roof and cover over it [the bread], and similarly elsewhere (Num. 4:7) [Scripture] says, “the half- pipes which cover (הַנָּסֶ),” and both of these [words]- יֻסַּ and (הַנָּסֶ) Are words meaning a roof and a cover. 30And thou shalt set upon the table shewbread before me alway. showbread Heb. לֶחֶם פָּנִים, lit., bread of faces, [given this appellation] because it has faces, as I explained [on verse 29]. The number of breads and the order of their stacks are explained in [the parsha of] אֱמֹר אֶל הַכֹּהֲנִים, “Speak to the Kohanim” (Lev. 21:1). 31And thou shalt make a candlestick of pure gold: of beaten work shall the candlestick be made: his shaft, and his branches, his bowls, his knops, and his flowers, shall be of the same. of hammered work Heb. מִקְשָׁה. Its Aramaic translation is נְגִיד, an expression of drawing out, [meaning] that he draws the parts out of the block of gold on either side by beating [it] with a hammer. The word מִקְשָׁה means the blow of a hammer, batediz in Old French, hammered, like “knocked (נָקְשָׁן) one against the other” (Dan. 5:6). its base This refers to the foot on the bottom [of the menorah], which was made like a box with three legs coming out of it [protruding] downwards. and its stem [This refers to] its central stem rising from the middle of the base, erected upward. At the top of it was the middle lamp, made like a spoon, into which the oil was poured and the wick inserted. its goblets They are a sort of cups made of glass, long and narrow, which are called maderins [in Old French], long, slender glass goblets. These, however, were made of gold, and they protruded from every branch according to the number prescribed by the text. They were [placed] on it [the menorah] only for beauty. its knobs [They were] like sort of round apples all around [the branch], protruding [outward] around the middle branch, in the style of the menoroth that are made for princes. They are called pomeles [in French], apple-shaped knobs (Men. 28b). Their number is prescribed in this parsha, [i.e.,] how many knobs protruded from it and how much [space] was [left] unadorned between one knob and another knob. and its flowers Engravings made on it like a sort of flowers. shall [all] be [one piece] with it Everything shall be of hammered work, out of the solid block [of gold], and not made separately and then attached [to the main stem]. coming out of its sides from here and there [in each direction] diagonally, drawn upwards until [they reached] the height of the menorah, which is the middle stem. They came out of the middle stem, one higher than the others: the bottom one was longest, the one above it was shorter than it, and the highest one shorter than that, because the height of their ends [at their tops] was equal to the height of the seventh, middle stem, out of which the six branches extended. 33Three bowls made like unto almonds, with a knop and a flower in one branch; and three bowls made like almonds in the other branch, with a knop and a flower: so in the six branches that come out of the candlestick. decorated Heb. מְשֻׁקָּדִים, as the Targum [Onkelos] renders מְצַיְירִין. They were decorated in the manner that silver and gold vessels are made, which is called nieler [in Old French, nieller in modern French, niello in English]. and three decorated goblets protruding from each branch. a knob and a flower were on each branch. 34And in the candlesticks shall be four bowls made like unto almonds, with their knops and their flowers. there are 22 almonds total ==== 22 hebrew letters! And on [the stem of] the menorah [shall be] four… goblets On the main stem of the menorah were four goblets: one protruding on it below the branches and three above the exit of the three branches that extended outwards from its sides. 35And there shall be a knop under two branches of the same, and a knop under two branches of the same, and a knop under two branches of the same, according to the six branches that proceed out of the candlestick. 36Their knops and their branches shall be of the same: all it shall be one beaten work of pure gold. 37And thou shalt make the seven lamps thereof: and they shall light the lamps thereof, that they may give light over against it. its lamps [They were] sort of cups into which the oil and the wicks were put. [so that they] shed light toward its face [Namely,] make the openings of the six lamps [which were] at the top of the branches that extend from of its [the menorah’s] sides, turned toward the middle one, so that when the lamps were lit they would shed light עֵבֶר פָּנֶיהָ, towards [or in the direction of] its face. Their light should be turned towards the face of the middle branch, which is the body of the menorah. 38And the tongs thereof, and the snuffdishes thereof, shall be of pure gold. And its tongs Heb. וּמַלְקָחֶיהָ. They are the tongs made to take the wicks from the oil, to set them in place and to draw them into the mouths of the lamps. Since they [are used for] taking (לוֹקְחִים) [the wicks] with them, they are called מֶלְקָחַיִם, a pair of “takers.” [The Aramaic word] וְצִבְיָתָהָא, which Onkelos renders [for וּמַלְקָחֶיהָ], is a term related to צְבַת, tenailles in French, tongs. and its scoops Heb. וּמַחְךְתֹּתֶיהָ. They are a kind of small cup with which he [the kohen] would scoop the ashes that are in the lamp every morning when he [the kohen] cleaned the lamps from the ashes of the wicks that burned during the night and were [now] extinguished. The word מַחְךְתָּה is [the equivalent of] poseydure [or poysedure] in Old French, a little shovel [or] ash pan, like “to scoop (לַחְךְתּוֹת) fire from a hearth” (Isa. 30:14). 39Of a talent of pure gold shall he make it, with all these vessels. 40And look that thou make them after their pattern, which was shewed thee in the mount. which you are shown Heb. אִשֶׁר-אַךְתָּה מָרְאֶה, as the Targum [Onkelos] renders: דִי אַךְתְּ מִתְחַזֵי, which you are shown. If it were punctuated מַרְאֶה with a “pattach,” it would mean that you show others. Now that it is punctuated with a short “kamatz,” it means that you are shown, that others show you, (for the punctuation distinguishes between the active and the passive). 1Moreover thou shalt make the tabernacle with ten curtains of fine twined linen, and blue, and purple, and scarlet: with cherubims of cunning work shalt thou make them. And the Mishkan you shall make out of ten curtains to be its roof and [cover its] walls outside the planks, for the curtains are hung behind them to cover them. shall be joined He [Bezalel] would sew them with a needle, one [curtain] alongside the other, five separately and [the other] five separately. to one another Heb. אִשָׁה אֶל-אִחֹתָהּ, lit., a woman to her sister. It is customary for Scripture to speak this way concerning a noun in the feminine gender, and concerning a noun in the masculine gender, אִישׁ אֶל-אָחִיו [lit., a man to his brother], as it is said concerning the cherubim: אִישׁ אֶל-אָחִיו (Exod. 25:20). 4And thou shalt make loops of blue upon the edge of the one curtain from the selvedge in the coupling; and likewise shalt thou make in the uttermost edge of another curtain, in the coupling of the second. loops Heb. לֻלָאֹת, lazoles in Old French, loops. So did Onkelos render [it]: עִנוּבִין, a term meaning a bow. curtain [that is] at the edge of the [first] set Heb. בַּחֹבָרֶת. On the curtain that is the outermost of the set. The group of five curtains is called חוֹבֶרֶת. and so shall you do on the edge of the outermost curtain of the second set On that curtain that is the outermost (הַקִּצוֹנָה), an expression derived from קָצֶה, end, meaning at the end of the set [of curtains]. the loops shall correspond to one another Heb. מַקְבִּילֹתהַלֻּלָאֹת. Make sure that you make the loops exactly equidistant from one another. Their measure on this curtain should be the same for its mate. When you spread one set [of curtains] next to the other set, the loops of this curtain shall line up exactly opposite the loops of the other [curtain]. This is the [meaning of the] word מַקְבִּילֹת, [i.e.,] this one opposite that one. The Aramaic translation of נֶגֶד, opposite, is לָקֳבֵל. [Each] curtain was twenty-eight [cubits] long and four [cubits] wide. When five curtains were joined together, it was found that [altogether] they were twenty [cubits] wide, and so [too] with the second set. The length of the Mishkan was thirty [cubits] from east to west, as it is said: “twenty planks for the southern side” (verse 18), and so for the north, [with] every plank a cubit and a half [wide]. Thus, [we have altogether] thirty [cubits] from east to west. The width of the Mishkan from north to south was ten cubits, as it is said: “And for the western end of the Mishkan [you shall make six planks]” (verse 22), and [thus with] two planks at the corners [i.e., one plank at each end of the western wall], we have ten. [I.e., the interior of the Mishkan was ten cubits wide, not counting the northern and southern walls, which were each one cubit thick. Hence, the remainder of the two corner planks that do not fit against the side planks is a half cubit each, equaling one cubit. The six planks along the western side total nine cubits, thus we have altogether ten cubits on the western side.] In their [respective] places, I will explain these verses. The curtains were placed [so that] their length [was across] the [interior] width of the Mishkan, ten [of the curtains’] middle cubits as the roof of the space of the width of the Mishkan. [Another] cubit from here and a cubit from there covered the thickness of the tops of the planks, whose width was a cubit thick. Thus remained sixteen cubits: eight on the north[ern side] and eight on the south[ern side], covering the height of the planks, which were ten [cubits] high. [Thus] the bottom two cubits were exposed. The curtains were forty cubits wide when they were joined-twenty cubits for each set. Thirty of them [of the forty cubits] were for the roof of the Mishkan’s [interior] space lengthwise; one cubit corresponded to the thickness of the ends of the planks on the [Mishkan’s] west[ern side] and one cubit [was meant] to cover the thickness of the pillars on the east[ern side]-for there were no planks on the [Mishkan’s] east[ern side], only four (Old Rashi-five) pillars upon whose hooks the screen was spread and hung, like a curtain. [Aside from the above two cubits,] there remained eight cubits that hung in the back of the Mishkan on the west[ern side], with the bottom two cubits uncovered. I found this in the Baraitha of Forty-Nine Middoth. However, in Tractate Shabbath (98b) [it is stated]: The curtains did not cover the eastern pillars, and nine cubits hung in the back of the Mishkan. The text supports us [in our quotation of the Talmud, for the Torah states]: “And you shall place the dividing curtain beneath the clasps” (verse 33), but if [the truth is] like the words of this Baraitha, [it would mean that] the dividing curtain would be found to be drawn back one cubit to the west of the clasps. golden clasps Heb. קַרְסֵי, fermeylz, fermels, fermails in Old French, [meaning] hooks, clasps. One of its ends is inserted into [one of] the loops of this [one] set [of curtains] and the other end into the loops of the [second] set [of curtains, thus] fastening them [the loops] with them [the clasps]. for a tent over the Mishkan To spread them over the lower curtains. and you shall fold the sixth curtain [I.e.,] of these upper curtains, which exceeds [overhangs] the lower ones. before the front of the tent Half its width [of the sixth curtain] was hanging and folded over the screen on the east[ern side of the Mishkan], before the entrance, resembling a modest bride whose face is covered with a veil. 10. "And you shall make fifty loops on the edge of one curtain, [which is] at the edge of the [first] set, and fifty loops on the edge of the [outermost] curtain of the second set. 11. "And you shall make fifty copper clasps; you shall bring the clasps into the loops, and you shall fasten the tent together so that it will become one. 12. "And the overhanging excess in the curtains of the tent half of the extra curtain shall hang over the rear of the Mishkan. And the overhanging excess in the curtains of the tent over the curtains of the Mishkan. The curtains of the tent were the upper ones, [curtains] of goat hair. 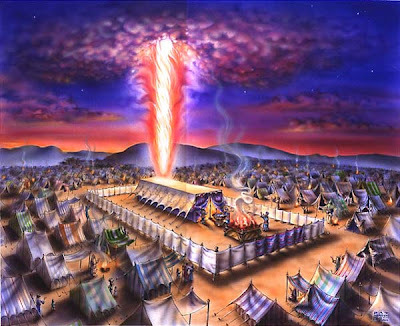 [They are] referred to as “tent,” as it is written about them, “for a tent over the Mishkan” (verse 7). Every expression of “tent” (אֹהֶל) stated in their context [i.e., referring to the upper curtains] is only an expression meaning a roof, for they form a tent and a roof over the lower [curtains]. They [the upper curtains] exceeded the lower ones by half a curtain on the west[ern side], since half of the extra eleventh curtain was folded opposite the front of the tent. [Hence,] there remained two cubits, [representing] the width of half of it [the upper curtains], exceeding the width of the lower [curtains]. shall hang over the rear of the Mishkan to cover the two cubits of the planks that were exposed. the rear of the Mishkan This means the western side, since the entrance [to the Mishkan] was on the east[ern side], which is [referred to as] its front, and the north[ern] and south[ern sides] are referred to as sides to the right and to the left. 13. "And the cubit from here and the cubit from there of the excess in the length of the curtains of the tent shall hang over the sides of the Mishkan from here and from there to cover it. And the cubit from here and the cubit from there on the north[ern] and on the south[ern] sides of the Mishkan]. of the excess in the length of the curtains of the tent which exceed the length of the lower curtains of the Mishkan by two cubits. 14. "And you shall make a covering for the tent of ram skins dyed red and a covering of tachash skins above. 15. "And you shall make the planks for the Mishkan of acacia wood, upright. 16. "Ten cubits [shall be] the length of each plank, and a cubit and a half [shall be] the width of each plank. and a cubit and a half [shall be] the width [From here] we learn [that] the length of the Mishkan, [which corresponds to the] twenty planks that were on the north[ern] and the south[ern sides] from east to west, was thirty cubits. 17. "Each plank shall have two square pegs, rung like, one even with the other; so shall you make all the planks of the Mishkan. one even with the other One [square peg was] aligned opposite the other so that their cut-away parts would be even, one with the measurement of the other, so that of the two square pegs, one shall not be pulled [more] toward the inside and one pulled [more] toward the outside of the thickness of the plank, which was a cubit. The Aramaic translation of יָדוֹת is צִירִין, hinges, because they resemble the hinges of a door, which are inserted into the holes of the threshold. 18. "And you shall make the planks for the Mishkan, twenty planks for the southern side. for the southern side Heb. לִפְאַתנֶגְבָּה ךְתֵּימָנָה. [The word לִפְאַת is derived from פֵּאָה, which usually means “corner.”] This [use of the word] פֵּאָה is not an expression meaning “corner,” rather the whole side is referred to as פֵּאָה, as the Targum [Onkelos] renders: לְרוּחַ עֵיבַר דָרוֹמָא, to the side toward the south. 19. "And you shall make forty silver sockets under the twenty planks; two sockets under one plank for its two square pegs, and two sockets under one plank for its two square pegs. 20. "And for the second side of the Mishkan on the northern side twenty planks. 21. "And their forty silver sockets: two sockets under one plank and two sockets under one plank. 22. "And for the western end of the Mishkan you shall make six planks. And for the…end of Heb. וּלְיַרְכְּתֵי, a word meaning “end” [in Hebrew, סוֹף], as the Targum [Onkelos] renders: וְלִסְיָפֵי. Since the entrance [of the Mishkan] is in the east, [thus] the east[ern side] is called the front and the west[ern side] the back. This is the reason it is [referred to as] the end, because the front is the beginning. you shall make six planks Hence, nine cubits are the width [of the Mishkan, since each plank is one and one-half cubits wide]. 23. "And you shall make two planks at the corners of the Mishkan at the end. And you shall make two planks at the corners One at the northwestern corner and one at the southwestern corner. All eight planks were in one row, but these two [in the corners] were not in the [interior] space of the Mishkan. Only a half cubit from here [from one plank] and a half cubit from there [from another plank] appear in the [interior] space, to complete its width to [the total of] ten [cubits]. The [extra] cubit from here and the cubit from there [i.e., of each corner plank] coincide with the cubits of the thickness of the planks of the Mishkan on the north[ern] and the south[ern sides], so that the corner would be even on the outside. 24. "And they shall be matched evenly from below, and together they shall match at its top, [to be put] into the one ring; so shall it be for both of them; they shall be for the two corners. And they shall be matched evenly from below All the planks must be flush at the bottom, so that the thickness of the edges of the two sockets should not form a gap to distance them [the planks] from one another. This is what I [meant when I] explained that the hinges of the square pegs [according to Yosef Hallel: the sides of the square pegs] should be cut out around their sides, so that the width of the plank should protrude on its sides away from the square pegs of the plank, [in order] to cover the edge of the socket, and so [with] the plank next to it [as well]. Thus, the planks are found to be flush with each other. [Each] corner plank in the western row was cut away in the width, in [the part of] its thickness [aligned] opposite the cut-away portion of the northern plank’s side, in order that the sockets should not separate them. and together they shall match Heb. תַמִּים, like תְאוּמִים, twins. at its top [The top] of the plank. into the one ring Every plank was cut away [a little] at the top along its width. [There were] two cuts on its two sides [to contain] the thickness of a ring. He [Moses] would insert them [the two planks] into one ring, thus it [the plank] would match the plank next to it. As for these rings, however, I do not know whether they were permanent or removable. On the corner plank, the ring was in the thickness of the southern and northern planks, (It appears that the words “the northern and the southern” belong further down, and Rashi means to say that the northern and the southern [planks] and the top of the corner plank in the western row were inserted into it [the ring]. What Rashi writes that the ring was in the thickness of the plank means in the thickness of the western plank. Give this some thought.) and the top of the [other] corner plank of the western row was inserted into it [this ring], resulting in the joining of the two walls. so shall it be for both of them For the two planks at the corners, for the plank at the [western] end of the north[ern side] and for the [adjacent] western plank; so too for the two corners. 25. "And there shall be eight planks and their silver sockets, sixteen sockets two sockets under one plank and two sockets under one plank. And there shall be eight planks Those are the [same] ones mentioned above: “you shall make six planks. And you shall make two planks at the corners of the Mishkan at the end” (verses 22, 23) [thereby there were eight planks on the western wall]. The following is the Mishnah concerning the making of the order of the planks in the [Baraitha] Melecheth HaMishkan (ch. 1): He made the sockets hollow and he cut out the plank from below, one-fourth from here and one-fourth from there, and the cut-away [area] was one half in the middle. He made for it [the plank] two square pegs like sort of two legs (חֲמוּקִים). I believe that the reading is: like sort of two חַוָּקִין, [which means] like sort of two rungs of a ladder which are separated from one another, and planed [in order] to be inserted into the hollow of the socket, like the rung, which is inserted into the hole of the side of the ladder. This is the word מְשׁוּלָּבֹת, [i.e.,] made like a sort of rung. He would insert them [the square pegs] into the two sockets, as it is said: “two sockets…two sockets…” (verse 25), and he would cut away the plank on top, [the width of] a finger from one side and [the width of] a finger from the other side, and he would insert [the edges of the two planks] into one golden ring so that they would not separate from one another, as it is said: “And they shall be matched evenly from below, etc.” (verse 24). This is [the wording of] the Mishnah [in Baraitha Melecheth HaMishkan], and I presented its explanation above in the sequence of the verses. bars Heb. בְרִיחִם, as the Targum [Onkelos] renders: עַבְּרִין, and in Old French espar(re)s, cross-bars. five for the planks of one side of the Mishkan These five [planks] were actually three, but the top and the bottom bars were made of two segments-one [part] would penetrate until half of the wall, and the other one would penetrate until half of the wall[’s length]. One [part of the bar] was inserted into a ring from this [one] side, and this [other] one was inserted into a ring on the other side until one [part of the bar] reached the other. Thus, the top one [bar] and the bottom one [bar] were two, but actually they were four. But the length of the middle one [bar] ran along the entire wall, and penetrated from one end of the wall to its other end, as it is said: “And the middle bar…shall [extend and] penetrate from one end to the other end” (verse 28). The top and bottom ones [bars] had rings on the planks in which they were to be inserted, two rings for every plank, attached in three places within the ten cubits of the height of the plank-one part from the highest ring to the top and one part from the lowest [ring] to the bottom. Each part was one-fourth of the length of the plank, and [there] were two parts between one ring and the other ring, so that all the rings would be aligned with the other. The middle bar, however, had no rings, but the planks were pierced through their thickness and it [the middle bar] was inserted into them by way of the holes, which were aligned one opposite the other. This is [the meaning of] what is said: “in the midst of the planks” (verse 28). The highest and lowest planks on the north[ern] and the south[ern sides] were each fifteen cubits long, and the middle one was thirty cubits long. This is [the meaning of] “from one end to the other end” (verse 28), from east to west. [Regarding] the five bars on the west: the top and bottom ones were six cubits long, and the middle one was twelve [cubits] long, corresponding to the width of the eight planks. It is explained this way in [the Baraitha] Melecheth HaMishkan (ch. 1). 27. "and five bars for the planks of the second side of the Mishkan, and five bars for the planks of the [rear] side of the Mishkan, on the westward end. 28. "And the middle bar in the midst of the planks shall [extend and] penetrate from one end to the other end. 29. "And you shall overlay the planks with gold, and their rings you shall make of gold as holders for the bars, and you shall overlay the bars with gold. as holders for the bars The rings that you shall make for them shall be holders for the bars to enter [them]. 30. "And you shall erect the Mishkan according to its proper manner, as you will have been shown on the mountain. And you shall erect the Mishkan After it is completed, erect it. you will have been shown on the mountain prior to this, for I am destined to teach you and show you the order of its erection. 31. "And you shall make a dividing curtain of blue, purple, and crimson wool, and twisted fine linen; the work of a master weaver he shall make it, in a [woven] cherubim design. a dividing curtain Heb. פָּרֹכֶת. [This is] a word denoting a dividing curtain. In the language of the Sages [it is called] פַּרְגוֹד (Chag. 15a), something that separates between the king and the people. the work of a master weaver Heb. מַעִשֵׂה חשֵׁב I have already explained (verse 1) that this is weaving of two walls, and the designs on both sides of it are unlike one another. cherubim He shall make designs of creatures. 32. "And you shall place it on four pillars of acacia wood, overlaid with gold, their hooks [shall be] gold, on four silver sockets. four pillars inserted into four sockets, with hooks attached to them [the pillars], bent on the top [in order] to place upon them a pole around which the top of the dividing curtain was wound. These hooks are the וָוִין [mentioned in the next verse, given this name] because they are made in the shape of [the letter] “vav” (ו). The dividing curtain was ten cubits long, corresponding to the width of the Mishkan [from north to south], and ten cubits wide, like the height of the planks. [It was] spread out at the one-third [point] of the Mishkan [from east to west], so that from it [the dividing curtain] toward the [Mishkan’s] interior were ten cubits, and from it [the dividing curtain] toward the exterior were twenty cubits. Hence, the Holy of Holies was ten [cubits] by ten [cubits], as it is said: “And you shall place the dividing curtain beneath the clasps” (verse 33), which join the two sets of the curtains of the Mishkan, the width of the set being twenty cubits. When he [Moses] spread them on the roof the Mishkan from the entrance [all the way] to the west, it [the first set of curtains] ended after two-thirds of the [way into the] Mishkan. The second set covered [the remaining] third of the Mishkan with the remainder [of the curtains] hanging over its rear to cover the planks. 33. "And you shall place the dividing curtain beneath the clasps. You shall bring there on the inner side of the dividing curtain the Ark of the Testimony, and the dividing curtain shall separate for you between the Holy and the Holy of Holies. 34. "And you shall place the ark cover over the Ark of the Testimony in the Holy of Holies. 35. "And you shall place the table on the outer side of the dividing curtain and the menorah opposite the table, on the southern side of the Mishkan, and you shall place the table on the northern side. 36. "And you shall make a screen for the entrance of the tent, of blue, purple, and crimson wool, and twisted fine linen the work of an embroiderer. 37. "You shall make for the screen five pillars of acacia and overlay them with gold, their hooks [shall be] gold, and you shall cast for them five copper sockets. 1. And you shall make the altar of acacia wood, five cubits long and five cubits wide; the altar shall be square, and its height [shall be] three cubits. 2. And you shall make its horns on its four corners; its horns shall be from it, and you shall overlay it with copper. its horns shall be from it [This means] that he should not make them [the horns] separately and [then] attach them to it [the altar]. 3. And you shall make its pots to remove its ashes, and its shovels and its sprinkling basins and its flesh hooks and its scoops; you shall make all its implements of copper. to remove its ashes Heb. לְדַשְׂנוֹ, to remove its ashes [and place them] into them [the kettles]. This is what Onkelos rendered: לְמִסְפֵּי קִטְמֵיהּ, to remove its ashes into them. In Hebrew, some words [are used in such a manner that] one word [i.e., the same root] changes in its meaning to serve [both] as building and demolishing [i.e., it has a positive and a negative meaning], like, “it took root (וַךְתַַּשְׁרֵשׁ)” (Ps. 80:10), “a fool taking root (מַשְׁרִישׁ)” (Job 5:3), and its opposite, “and it uproots (תְשָׁרֵשׁ) all my grain” (Job 31:12); similar to this, “on its branches (בִּסְעִיפֶיהָ) when it produces fruit” (Isa. 17:6), and its opposite, “lops off (מְסָעֵף) the branches” (Isa. 10:33); similar to this, “and this last one broke his bones (עִצְּמוֹ)” (Jer. 50:17) [עִצְּמוֹ, which usually means “became boned,” here means] “broke his bones” ; similar to this, “and stoned him with stones (וַיִּסְקְלֻהוּ בָּאִבָנִים)” (I Kings 21:13), and its opposite, "clear it of stones (סַקְּלוּ מֵאֶבֶן) ” (Isa. 62:10), [meaning] remove its stones, and so, “and he fenced it in, and he cleared it of stones (וַיִּסְקְלֵהוּ)” (Isa. 5:2). Here too, לְדַשְׁנוֹ means “to remove its ashes (דִשְׁנוֹ),” and in Old French, adeszandrer, to remove ashes. and its shovels Heb. וְיָעָיו. [Its meaning is] as the Targum [Onkelos renders: וּמַגְרפְיָתֵיה]: shovels with which he [the kohen] takes the ashes. They are [similar to] a kind of thin, metal lid of a pot, and it has a handle. In Old French [it is called] videl, vedil, vadil, [all meaning] shovel. and its sprinkling basins Heb. וּמִזְרְקֹתָיו, with which to receive the blood of the sacrifices. and its flesh hooks Heb. וּמִזְלְגֹתָיו. Sort of bent hooks, with which he [the kohen] would strike the [sacrificial] flesh. They [the hooks] would be imbedded into it, and with them, he would turn it over on the coals of the [altar] pyre in order to hasten its burning. In Old French [they are called] crozins, [meaning flesh] hooks, and in the language of the Sages [they are called], צִינוֹרִיּוֹת (Yoma 12a). and its scoops Heb. וּמַחְךְתֹּתָיו. They had a cavity in which to take coals from the altar and to carry them onto the inner altar for incense [which was within the Mishkan]. Because of their [function of] scooping (חֲתִיֹּתָן), they are called scoops (מַחְךְתּוֹת), like “to scoop (לַחְךְתּוֹת) fire from a hearth” (Isa. 30:14), an expression of raking fire from its place, and likewise, “Can a man rake (הִיַחְךְתֶּה) embers with his clothes?” (Prov. 6:27). all its implements Heb. לְכָל-כֵּלָיו. Like כָּל כֵּלָיו. 4. And you shall make for it a copper grating of netting work, and you shall make on the netting four copper rings on its four ends. grating Heb. מִכְבָּר, a word meaning a sieve (כְּבָרָה), which is called crible [in French], [meaning] a sort of garment made for the altar, made with holes like a sort of net. This verse is inverted, and this is its meaning: And you shall make for it a copper grating of netting work. 5. And you shall place it beneath the ledge of the altar from below, and the net shall [extend downward] until the middle of the altar. the ledge of the altar Heb. כַּרְכֹּב, a surrounding ledge. Anything that encircles anything else is called כַּרְכֹּב, as we learned in [the chapter entitled] Everyone May Slaughter (Chul. 25a): “The following are unfinished wooden vessels: Any [vessel] that is destined to be smoothed or banded (לְכַרְכֵּב).” This [refers to the practice] of making round grooves [or bands] in the planks of the walls of wooden chests and benches. For the altar as well, he [Bezalel] made a groove around it a cubit wide. [The groove was] on its wall for decoration, and that was at the end of three (other editions: six) cubits of its height, according to the one who says that its height was twice its length and [asks] how then can I understand [the verse] "and three cubits its height"? [Three cubits] from the edge of the ledge and higher. There was, however, no surrounding ledge [i.e., walkway] on the copper altar for the kohanim to walk on, except on its top, within its horns. So we learned in Zev. (62a): What is the ledge? [The space] between one horn and the other horn which was a cubit wide. Within that there was a cubit for the kohanim to walk, and these two cubits are called כַּרְכֹּב. We [the Sages of the Gemara] questioned this: But is it not written, "beneath the ledge of the altar from below"? [Thus we learned] that the כַּרְכֹּב was on its [the altar’s] wall, and the “garment” of the grating was below it [the ledge]. The one who answered [i.e., one of the Sages of the Gemara] replied: “There were two [ledges], one for beauty and one so that the kohanim should not slip.” The one on the wall was for decoration, and below it, they adorned [it with] the grating, whose width extended halfway up the altar. Thus, the grating was a cubit wide, and this was the sign of the middle of its [the altar’s] height, to distinguish between the upper “bloods” and the lower “bloods” [i. e., the blood of the sacrifices required to be sprinkled on the top of the altar and the blood of the sacrifices required to be sprinkled on the bottom of the altar]. Corresponding to this, they made for the altar in the Temple a kind of red line [other editions: the “girdle” of the red line] in it [the altar’s] center [point] (Middoth 3:1) and a ramp upon which they [the kohanim] would ascend it [the altar]. Although [the Torah] did not explain it in this section, we were already informed in the parsha [that begins] “An altar of earth you shall make for Me” (Exod. 20:21-23): “And you shall not ascend with steps.” [I.e.,] you shall not make steps for it on its ramp, but [you shall make] a smooth ramp. [Thus] we learn that it [the altar] had a ramp. [All the above] we learned in the Mechilta (Exod. 20:23). The “altar of earth” [mentioned in Exod. 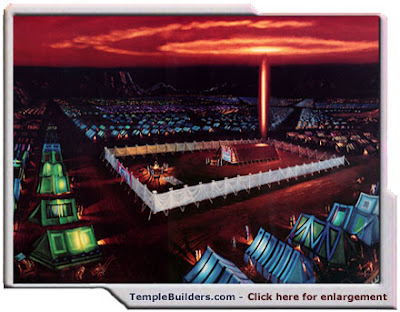 20:21] was the copper altar, which they filled with earth in [all] the places of their encampment. The ramp was to the south of the altar, separated from the altar by a hairbreadth. Its base reached [until] a cubit adjacent to the hangings of the courtyard on the Mishkan’s southern [side], according to [the opinion of] those who say that it was ten cubits high. According to the opinion of those who say that the words are [to be understood] literally -"its height [shall be] three cubits" (verse 1)-the ramp was only ten cubits long. I found this in the Mishnah of Forty-Nine Middoth. [What I stated,] that it [the ramp] was separated from the altar by the width of a thread [i.e., a hairbreadth], [derives from] Tractate Zevachim (62b), [where] we learned it from the text. 6. And you shall make poles for the altar, poles of acacia wood, and you shall overlay them with copper. 7. And its poles shall be inserted into the rings, and the poles shall be on both sides of the altar when it is carried. into the rings Into the four rings that were made for the grating. 8. You shall make it hollow, out of boards; as He showed you on the mountain, so shall they do. hollow, out of boards Heb. נְבוּב לֻחֹת as the Targum [Onkelos and Jonathan] renders: חִלִיל לוּחִין. [There should be] boards of acacia wood from all sides with a space in the middle. But all of it shall not be [made of] one piece of wood [that would measure] five cubits by five cubits, like a sort of anvil [i.e., like one solid block]. 9. And you shall make the courtyard of the Mishkan on the southern side [there shall be] hangings for the courtyard of twisted fine linen, one hundred cubits long on one side. hangings Heb. קְלָעִים. Made like the sails of a ship, with many holes, braided, and not the work of a weaver. Its Aramaic translation is סְרָדִין [a sieve], like the Aramaic translation of מִכְבָּר, which is סְרָדָא, because they were [both] perforated like a sieve. 10. And its pillars [shall be] twenty and their sockets twenty of copper; the hooks of the pillars and their bands [shall be of] silver. And its pillars [shall be] twenty Five cubits between [one] pillar and [another] pillar. the hooks of the pillars Heb. וָוֵי הָעַמֻּדִים. They are the hooks. and their bands Heb. וַחִשֻׁקֵיהֶם. The pillars were encircled all around with silver threads. I do not know whether [they were encircled] on their entire surface, [or only] at their top or in their middle, but I do know that חִשׁוּק is an expression of girding [or belting], for so we find in [the episode of] the concubine in Gibeah: “And with him was a team of saddled (חֲבוּשִׁים) donkeys” (Jud. 19:10), which is translated into Aramaic [by Jonathan] as חִשִׁיקִין. 11. And so for the northern end in the length hangings one hundred [cubits] long, its pillars twenty, and their sockets twenty of copper; the hooks of the pillars and their bands of silver. 12. The width of the courtyard on the western side, hangings fifty cubits, their pillars ten and their sockets ten. 13. The width of the courtyard on the eastern side, fifty cubits. on the eastern side Heb. לִפְאַתקֵדְמָה מִזְרָחָה. The eastern side is called קֶדֶם, a word meaning the face [or front], and אָחוֹר signifies the back. Therefore, the east is called קֶדֶם, which is the face, and the west is called אָחוֹר, as it is said: “the back (הָאַחִרוֹן) sea” (Deut. 11:24, 34:2), [which is translated into Aramaic as] יַמָּא מַעַרְבָא, the western sea. fifty cubits These fifty cubits were not all closed off with hangings, because the entrance was there, but [there were] fifteen cubits of hangings for [one] shoulder of the entrance from here [from one side] and similarly for the second shoulder. There remained the width of the space of the entrance in between, [which was] twenty cubits. This is what is said [in verse 16]: “And at the gate of the courtyard shall be a screen of twenty cubits,” [i. e.,] a screen for protection opposite the entrance, twenty cubits long, which equaled the width of the entrance. 14. The hangings on the shoulder [shall be] fifteen cubits, their pillars three and their sockets three. their pillars three Five cubits between [one] pillar and [another] pillar. Between the pillar that is at the beginning of the south, which stands at the southeastern corner, until the pillar that is [one] of the three in the east, there were five cubits. And from it [this pillar] to the second one [there was a space of] five cubits, and from the second to the third [were] five cubits, and likewise for the second [i.e., the northeastern] shoulder, and four pillars for the screen. Thus, there were ten pillars on the east, corresponding to the ten pillars on the west. 15. And on the second shoulder [there shall be] fifteen hangings, their pillars three and their sockets three. 16. And at the gate of the courtyard shall be a screen of twenty cubits, [made] of blue, purple, and crimson wool, and twisted fine linen, the work of an embroiderer; their pillars four and their sockets four. 17. All the pillars around the courtyard [shall have] silver bands, silver hooks, and copper sockets. 18. The length of the courtyard [shall be] one hundred cubits and the width fifty by fifty [cubits]. The height [of the hangings] shall be five cubits of twisted fine linen, and their sockets [shall be of] copper. The length of the courtyard the north[ern] and the south[ern sides] from east to west were one hundred cubits. The height…five cubits [I.e.,] the height of the partitions of the courtyard, which was the width of the hangings. and their sockets [shall be of] copper [This is mentioned] to include the sockets of the screen, so that you would not say [that] copper sockets were mentioned only in regard to the pillars of the hangings, but the sockets of the [pillars of the] screen were of another kind [i.e., a different material]. So it appears to me that for this [reason], they [the copper sockets] were repeated. 19. All the implements of the Mishkan for all its labor, and all its pegs and all the pegs of the courtyard [shall be] copper. 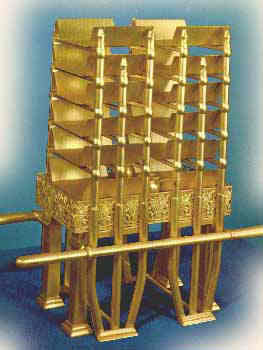 All the implements of the Mishkan that were required for its assembling and its disassembling, e.g., sledge hammers to drive in the pegs and the pillars. the pegs [These were] like copper bars, made for the curtains of the tent and for the hangings of the courtyard, tied with cords all around [them] at their bases [i.e., at the bases of the curtains and the hangings], so that the wind would not lift them up. But I do not know whether they [the pegs] were driven into the ground or whether they were tied [with cords] and hung-their [heavy] weight weighted down the bottoms of the curtains so that they would not move in the wind. I say, however, that their name [i.e., pegs] indicates that they were driven into the ground. Therefore, they were called יְתֵדוֹת, and this verse supports me [my assertion]: “a tent that shall not fall, whose pegs (יְתֵדֹתָיו) shall never be moved” (Isa. 33:20). Messiah is seated... signifying that his work is completed and perpetually effective for all who entrust themselves solely to Him. Everything that Israel had done in worship on earth - all the rituals and all the symbols corresponded to the heavenly temple/pattern. Jeremiah 31 31Behold, the days come, saith the LORD, that I will make a new covenant with the house of Israel, and with the house of Judah:32Not according to the covenant that I made with their fathers in the day that I took them by the hand to bring them out of the land of Egypt; which my covenant they brake, although I was an husband unto them, saith the LORD: 33But this shall be the covenant that I will make with the house of Israel; After those days, saith the LORD, I will put my law in their inward parts, and write it in their hearts; and will be their God, and they shall be my people. 34And they shall teach no more every man his neighbour, and every man his brother, saying, Know the LORD: for they shall all know me, from the least of them unto the greatest of them, saith the LORD: for I will forgive their iniquity, and I will remember their sin no more.